Lowongan Kerja PT Jaya Real Property - Proyek unggulan PT Jaya Real Property Tbk adalah sebuah kawasan mandiri seluas 2.000 hektar yang menawarkan beragam produk perumahan dan komersial yang didukung oleh fasilitas pendidikan, rekreasi, pelayanan kesehatan serta jaringan transportasi yang terintegrasi dan terhubung dengan seluruh bagian Jabodetabek. Untuk mencapai visi perusahaan yaitu menjadi kelompok bisnis terkemuka di Indonesia yang memberikan pelayanan terbaik kepada stakeholder-nya, PT Jaya Real Property sedang mencari pemuda - pemudi terbaik yang sangat kompeten dan termotivasi diri untuk mengisi posisi lowongan kerja terbaru 2016. Persyaratan : Optimize cash flow, funding, and loan, monitoring budget and outstanding payment settlement Understand tax provision (PPh, PPN), experience in the related field (finance/ AR/ AP) Good communication, analytical thinking, and leadership skills Bachelor of Accounting/Finance. Having 0 - 1 year experience in related position. Persyaratan : Making promotion tools design (printed & outdoor media Design & create media design layouts, graphics Responsible for the production of highly impressive creative visuals in a timely manner Bachelor/Master of Graphic Design/ Creative Multimedia, min. GPA 2.75 (Bachelor) out of 4.00. Max. age 35 years old. Min. 0-1 year experience in related position. Placement in Tangerang. Persyaratan : Perform publication and relationship building with pers and media. Coordinating with supplier/ageny for media support Eager to meeting new people, challanges, and have outside the box creative ideas Having good communication and presentation skills Bachelor in marketing management/communication/public relation. Min GPA 2.75 out of 4.00. Max 35 years old. Having 0-1 year experience in related position would be advantage Placement in Tangerang. Persyaratan : Conduct analysis, design, planning, manufacture, and testing of application programs Perform maintenance of application programs Conducting archiving and documentation of the source application program. Determining procedures in the implementation of application programs. Mastering Web-based Programming (PHP / ASP), mini master OS. Win XP and Win Server 2003 Understanding the Oracle Database and the Open Database Connectivity (ODBC). Diploma/Bachelor in Information System/Informatics Engineering min. GPA 2.75 out of 4.00. Maximum age 35 years old. Placement in Tangerang Selatan. Persyaratan : Ensure quality, time and quantity as assigned in project. Managing all resources; manpower, materials and contractors to ensure scheduled completion. Having excellent understanding of Project Management, preferably in high-rise building structure. Having good leadership, communication, and negotiation skills. Bachelor/Master of Architect / Civil Engineering, min. GPA 2.75 (Bachelor) and 3.00 (Master) out of 4.00. Maximal age 35 years old. Having 5 years experience in related position would be advantage, preferably in high-rise building /housing construction. Placement in Tangerang Selatan. Bagaimana anda tertarik bekerja di PT Jaya Real Property ....? 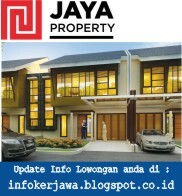 0 Response to "Lowongan Kerja PT Jaya Real Property"